Fishing theme cabin. Living Room has a sleeper sofa and electric fireplace. Kitchenette with 2-burner electric stove, refrigerator, bar size sink, microwave, large countertop oven. Eating spots are the counter with 4 bar stools, or pub table with 2 stools. Private back porch with additional deck with a roof located on the side at the entry. Bedroom has a rustic log queen size bed. Adjacent "Camper's Cabin"* has a full size bed for those extra guests! 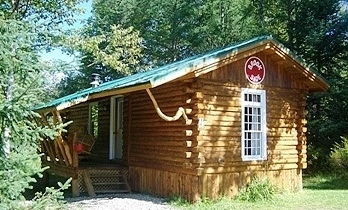 Just a short walk to the facilities located in the Brookside Cabin. * Extra "Camper's Cabin" is available from Memorial Day through Columbus Day weekend; provides sleeping for 2 additional guests. *The above rates are for up to 4 guests, kids under 2 years old stay free.